Plagiarism can be a real pain. Most teachers have had to deal with it in some form or another, and a whole lot of you still haven’t quite figured out the best way to combat it. Many of us issue stern warnings and threaten serious, soul-crushing consequences. Others also use software to detect plagiarism. While these methods can deter students from plagiarizing and catch them if they do, they operate on the assumption that all plagiarism is devious, that all students who plagiarize know exactly what they’re doing, and our mission is to catch and punish. Now because I don’t believe that assumption is true, I think we could be handling the problem with a lot more finesse. How Well Do Students Understand Plagiarism? In my own experience as a teacher and a parent, I have seen acts of plagiarism that I truly believe were rooted in ignorance. Take my 5th-grade daughter, for instance. A few months ago, she and her best friend were collaborating on a Google Slides presentation about a Native American tribe. Reading over it as she worked, I found sentence after sentence written in language she never could have come up with. When I asked her where she got the information, she told me point blank that she copied and pasted it from a website. It took me forever to explain why that was wrong and what she needed to do instead. She seriously had no idea. She wasn’t trying to cheat. Eventually, I convinced her that she really, really needed to revise, and even though she did, I could tell she was mostly humoring me. Okay, that’s 5th grade, you say. Surely it gets better as students get older? Marginally. Let’s take a look at college undergrads. In two separate studies, undergraduates were asked to identify incidences of plagiarism. In both, students’ ability to correctly label plagiarism could best be described as limited (Dawson & Overfield, 2006; Marshall & Garry, 2005). In other words, a significant number of students have an incomplete understanding of what plagiarism actually is. And if they don’t always know when they’re doing it, it’s going to be pretty hard to get them to stop. To be clear, I’m not arguing that all students who plagiarize are innocent. I’ve had students whose attempts at passing off someone else’s work as their own were so blatant, I took it as a personal insult. But I do believe we can cut way back on less deliberate instances of plagiarism by teaching students the skills to avoid it. Unfortunately, students are expected to learn how to avoid plagiarism by some kind of osmosis. As they progress from grade to grade, they are expected to already know how to weave research into their writing in original, elegant, and ethical ways, but far too often, they don’t have this skill set. Not at all. We need to explicitly teach these skills, and we need to do it more than once if we want good results. How? First, we need to help them identify plagiarism. When students are shown different examples of plagiarism and taught—even through basic lecture—the many forms it can take, their understanding of what constitutes plagiarism gets much more sophisticated (Landau, Druen, & Arcuri, 2002; Moniz, Fine, & Bliss, 2008). Then we need to give them practice in correctly citing their sources. When students get hands-on practice with paraphrasing and correctly citing sources, especially if that practice comes with instructor feedback, plagiarism is significantly reduced (Emerson, Rees, & MacKay, 2005). 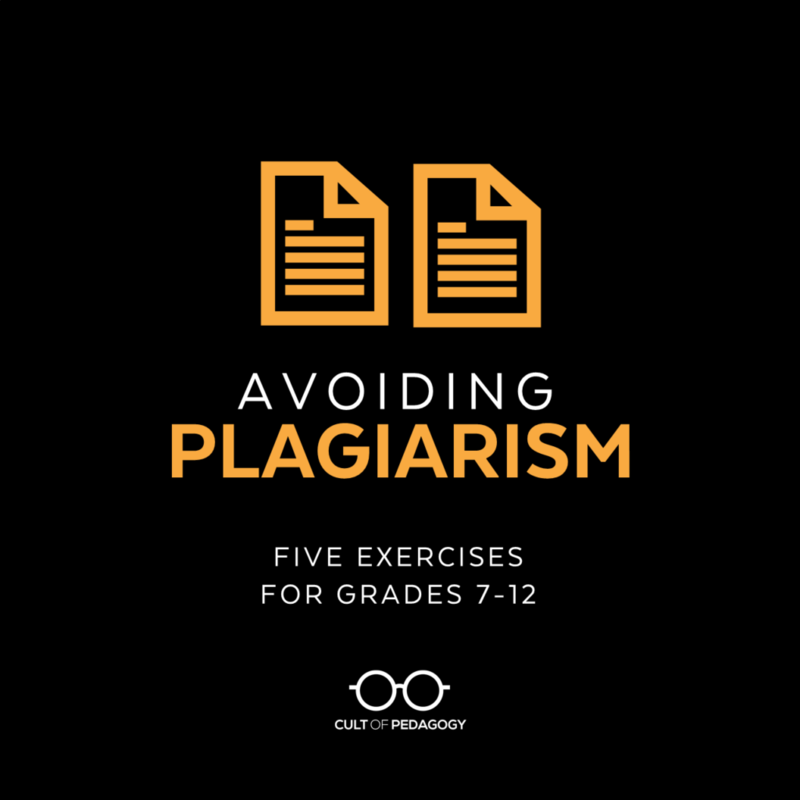 Below I have outlined five exercises you can do with students in grades 7-12 to give them a much better understanding of what plagiarism is and how to correctly integrate research into their own writing. First, use simple texts for practice. If you want students to read and cite challenging academic texts, that’s fine for later, but to teach them the skills of writing from research and giving proper credit, make the reading material easy so they don’t waste energy struggling with that. Once they have the writing and citation skills down, they’ll be better equipped to plug in more challenging sources. Second, do these exercises together in class. These would not be good lessons for flipped or blended learning, where students just work through them on their own. The skills are complex and often require a judgment call to determine if they have been done correctly. For every exercise, students should be getting feedback from you, from their group members, or both. Setting aside class time to do these together will pay off in the long run. As mentioned earlier, students have an incomplete understanding of what actually constitutes plagiarism. This exercise uses the concept attainment instructional strategy of showing students “yes” and “no” examples to help students refine their definition of a concept. Have students read a short, simple text. This could be anywhere from 500-800 words, on a somewhat familiar topic. Something like this article about avocados would do the trick. Show several teacher-created examples of student writing based on that text. In some cases, the writing should demonstrate plagiarism, and in other cases, it should not. For each one, have students decide whether they think it represents plagiarism or not. Have them discuss this in groups if possible. After each example, tell them if they are correct or not, and explain why. Once students know what plagiarism looks like, have them practice putting the information they learn from texts into their own words. Here we’re not talking about a full-length summary; the skill of summarization can be applied in smaller bursts, and it’s absolutely necessary for writing about the things you research. Students need to be able to read something, digest it, then explain what they learned in their own language. In the context of plagiarism, that skill is referred to as summarization. For this exercise and the ones that follow it, use a classic I do, we do, you do format to model the process described below: Start by modeling the process yourself (the “I” step), then repeat it as a whole class with you in the lead or by having students try it in pairs or groups (the “we” step), and finally have students make a fresh attempt on their own (the “you” step). Choose a 1-2 paragraph section of a text. (If you haven’t already gutted the one used for Exercise 1, that will work; otherwise, find a fresh one). Read it several times to make sure you understand it. Turn your paper over (or minimize their screen, if you are reading it digitally), then think for a minute about what the section said. Next, turn to a partner or group and explain what you learned from the paragraph in your own words. Write a few sentences summarizing that information without looking back at the original source. Their summary should sound like YOU, not the source. After you have written your summary, check the original source to make sure your summary is correct and that key terms are spelled correctly. This process, if done carefully, will show students how important is is to disconnect from the original text when composing. After the “you do” part of the exercise, let students study the paragraphs of their peers and evaluate each other for plagiarism. Looking at how other people summarized the same idea will help them see the range of possibilities. There’s a fine line between summarizing and paraphrasing, which is explained here by the OWL at Purdue. Each one needs to be treated a little differently. When you summarize, you are pulling together lots of information and making it your own. When you paraphrase, you are taking a more specific, unique idea from one author and using similar—but not exactly the same—language. Read a section of a text (like the avocado article mentioned above). Have students practice the same skill with a different passage, checking their response with each other, then reviewing it with the class. The next level up from paraphrasing is using some of the exact words from the source. This will help students understand that the only time it’s okay to copy someone else’s exact words into your work is when you put those words in quotes and give them credit for them. For this exercise, use the same I do, we do, you do pattern as in exercises 2 and 3 to show students how to quote a sentence or phrase from the original text, using some of the same sentence stems from exercise 3. At the university level, students are expected to use a formal citation style (such as MLA or APA) when writing papers, and the Common Core requires students to start applying a formal citation style as early as grade 7. So choose the style your district uses most frequently and teach students the basics. Give students 2 to 3 sample items to use as practice sources. I recommend sticking with simple, predictable items that resemble the kinds of things students will access in their own research. For middle and secondary students, this most likely means online articles and (maybe) books. Start with the references list at the end of the paper (or Works Cited, if you’re doing MLA). I recommend beginning this way because many students will already be somewhat familiar with the concept of a bibliography, so this is a logical jump. Also, when you do in-text citations later, those citations will actually refer to something, since the references will already be listed at the end. After you’ve built the references list, show students how to modify the author mentions they already made in exercises 3 and 4 so they match the in-text citation format of your chosen style. Do all of this slowwwwly, with plenty of time for students to check their work with you and with each other. When you think they have the basics down, throw two new resources at them—a book and an online article—and see if they can repeat the process: First have them build a reference list, then then paraphrase something from each one and do an in-text citation for each. By the way, citation generators like EasyBib and BibMe or the citation feature in Google Docs can be wonderful time savers, but because they are not fail-safe, students will get the most use out of them after they learn to do their own citations manually. Get these exercises in a classroom-ready mini-unit! If you like the exercises described in this post and want them ready to teach tomorrow, get a copy of Avoiding Plagiarism, my classroom-ready mini unit for grades 7-12. It contains all five exercises in PowerPoint slideshows, plus printable handouts for student use. Good suggestions. I have found using Google Docs with students where I can see their revision history really helps to see intent and process. Also, there is a great Chrome extension called Draftback that allows you to “watch” them write their papers. Jenn, thanks for the techniques! They would work equally well for college students, as I had a recent incident regarding plagiarism. The “yes” and “no” examples of what plagiarism looks like make it more concrete. As you suggested, students may not even really know that plagiarism can be subtle, so giving them real examples to review as a class is helpful. Hope this contributes to the conversation! This year I had a student respond to a prompt with an entire diatribe about the No Child Left Behind Act that was published on the NEA website, and I am the president of my local! Of course I recognized it right away as copied but the first time that it happens, I don’t accept the essay but say “I want to hear from you. Rewrite this in your voice.” And then I did a presentation where I claimed the artwork of both Leonardo da Vinci and Warhol as my own just to make a point. Sometimes they really want to impress you and you need to make it safe to impress you by being themselves. Thanks for sharing your priceless tips, this information would be very helpful not only for educators but also for students. I’m excited to use it in my classroom and I’d be glad to share my favorite guide on how to avoid plagiarism with you and your audience: https://unplag.com/materials/free-plagiarism-guide/book.pdf. It helped my students so much! Now they clearly know what plagiarism is and how to avoid it. Highly recommended! It’s also helpful, I think, to explain to them why it’s important to give credit to their sources–so that others can access them, too. I have found that many of my students had never thought of it that way. It gives them a reason for citing– many of them seem to think that their teachers just make them do it to torture them. ? Yup, totally wish that I had this when I was trying to teach research papers! I think that cheating is usually an act of desperation, but when students fully understand what they’re doing, they are much less likely to get that desperate. Another technique that I have found to avoid plagiarism is to assign something that is completely different from the source material–like writing a short story based on research. Newsela has a very good article that I will use to start the discussion before I teach them how to avoid plagiarism. Sure! That would be fine. Just be sure to link back to the original source (or cite it if it is only in print). Thanks for asking! Plagiarisim is really problem both high school and university students. Many of them do not know what it is. I find having students summarize in a single sentence how the information they plan to use supports their thesis is preferable to paraphrase. That’s because a sentence-by-sentence paraphrase or paragraph-by-paragraph paraphrase becomes plagiarism when it reproduces the reasoning of the original. Such plagiarism is a serious problem in higher ed and among academics. I appreciate the effort that had gone into creating this post and podcast. My concern is that at no point do you acknowledge the expert resource that may be available in the school, the librarian. One of their primary roles is as an expert in information literacy and avoiding plagiarism. The comment that students are meant to assume an understanding of plagiarism through osmosis blatantly disregards the expertise of the school librarian. Ask them and I am sure they would jump at the opportunity to run a lesson on plagiarism, academic honesty, citations and reliable information sources. You make a good point, Claire. Everyone should definitely be encouraged to collaborate with their library/media specialists when tackling this problem! This plagiarism is such a pain. I’m a first year student & already we have been given a task to create short one page advising students on how to avoid plagiarism. – Identify 3 questions you will ask yourself before attempting. I have used nursery rhymes with great success and humor. I give my students nursery rhymes to put into their own words. It is fun and gets the point across. I think its a behavior issue and needs to be treated as such. It also is best as a school policy that everyone carries out consistently. 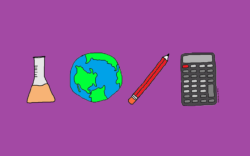 Could you use these lessons with 4th Graders? Hi Rose! Jenn’s Avoiding Plagiarism mini-unit is geared for grades 7-12, however, I think many of the strategies can work really well with most grades. I’d just modify the lessons (i.e. length of text, citations) according to what you know about your kids. In my district, the conversation about plagiarism starts with research in a very basic way in our K-2 schools during library classes. As a librarian in a 3-5 school, I scaffold on this learning using lessons similar to Jennifer’s excellent methods. Our goal is to have every child leave for middle school “college ready” in terms of understanding and identifying plagiarism, utilizing paraphrasing techniques, and correctly completing multiple source citations. It’s never too early to start! I was an plegiric fool!!!! Thank you, Jenn! Do you have any recommendations for the best apps/tech resources to use with high school students? Diigo? Google docs? My teaching experience has been in jr high, so I don’t know if there’s something better for the upperclassmen. I think the resources you mention using in junior high would work equally well at the high school level. For additional ideas, check out the technology section of Jenn’s blog. You also might try her Pinterest board on teaching with technology.